The University Community Chorus is a self-sustaining and vital choral ensemble in the University of Arizona School of Music. 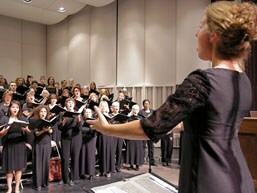 Its mission embraces the musical function of the group, as well as educational and outreach components. Outreach is in membership — which is open to community members as well as students, faculty and staff — and also in performances, which are intended to enrich the cultural environment of the greater Tucson area. The educational aspect of the mission is served through exposure of the membership to a varied repertoire of choral music, and in the development and application of musical, rehearsal, vocal, and performance skills and knowledge in a positive learning environment. The desired outcome is artistic and musical growth, excellence in performances, and the development of appreciation of choral literature in the members and audience. Literature is chosen by the director to facilitate these goals, and to suit the current strengths and abilities of the ensemble.